Brian Croft, pastor of Auburndale Baptist Church, teamed up with his associate pastor Jason Adkins who leads and plans ABC’s worship. This is the sixth book review I have done for Pastor Croft’s works, all of which are wonderful resources for new or even seasoned pastors. You can read my other reviews here: The Pastor’s Family, The Pastor’s Ministry, The Pastor’s Soul, Caring for Widows, and Pray for the Flock. That being said…Gather God’s People: Understand, Plan, and Lead Worship in Your Local Church, published by Zondervan in 2014, is a pretty good book. I know that isn’t the best language to use when reviewing a book. It’s very non-committal. Let me explain why, and perhaps you can forgive me for such a review. Having read five other books by Pastor Croft, most of which were co-authored, Gather God’s People simply had an altogether different feel or vibe to it. I should have expected it, since the first words of the introduction are, “I (Brian) have a confession to make. Jason, my coauthor, is really the one who wrote this book,” (p. 13). Pastor Croft does directly contribute to portions of the book, but by and large this is Jason Adkin’s book, with Jason Adkin’s thinking and writing style. I have often read that we are not to review the book that we wish we had read, but the book in which we actually read. And for that reason, I want to say that outside of the writing style that I’m used to from a Brian Croft book, this book was well-written and wonderfully practical, as I have come to expect from Practical Shepherding books. The task of planning worship songs for a weekly gather is not about perpetuating perceptions about your church. Worship planners ought to equip believers to carry out the commands to edify one another through “psalms and hymns and spiritual songs” and to address their praises to God with a heartfelt melody (Ephesians 5:19, ESV). Gather God’s People is laid out into three sections rather than two like many of these practical guides. Normally the layout tends to be the why and the how. In this particular book it is more of the why, the how, and the do. After all, “Ministers must prepare to present the various elements in the service in a way that aids the worship of the congregation rather than hinders it,” (p. 86). The first part is written to help us “Understand Worship.” Its chapters are about the biblical theology, elements, and spirituality of worship. It is a crash course in worship which quickly goes through what many worship books deal with as a whole. The second part is showing one how to actually “Plan Worship.” This was the most helpful part of the book for me. It is made up of three chapters as well. Interestingly enough, there is not much on “preaching the word,” though it is the first element or objective. I would venture to say that the reason is that this is not a book on hermeneutics, but worship as a whole. Pastor Croft’s book on The Pastor’s Ministry would deal more with that, as well as many other books on preaching. The three chapters deal with the reading, praying, and singing of the Word. Pastor Adkins details how to plan each of these aspects and does not shy away from the fact that emotions (though not emotionalism) are involved in worship. There is a feeling that is invoked as we worship, and leaders/planners need to be mindful of that. “Acknowledge the emotional and spiritual condition of your congregation in your planning. Furthermore, intended emotional responses should play a role in planning,” (p. 77). The final part is about leading the congregation in these areas. The final three chapters (not including the Conclusion or appendices) are in this section. It is there that the authors deal with the actual worship service and the implementation of what has been planned. It is also here that the ordinances (the “seeing the word”) aspect of worship is brought up. A quick note on the appendices: they are mostly showing how the Psalms can be incorporated into the music aspects of congregational worship. There are arguments for doing so along with examples of them set to familiar tunes. All in all, this was a helpful and practical book. It is probably the most practical book on worship I have read. Much of what I tend to read is theoretical or theological, but rarely do authors have the gumption to get down to the nitty-gritty details of planning and executing the worship service. While it took me a little longer to read this work, coming in at only 143 pages, due to the writing style and the holidays, I appreciated the contents of it. I readily give it 4 stars on Good Reads, and readily commend it to every pastor and/or worship leader. Brian Croft has done it again! I am probably becoming this pastor’s biggest fan. This is the fifth book I have read of his in as many weeks; I am just as impressed with this one as I was the first, perhaps even more so. You can read my other reviews on The Pastor’s Soul, The Pastor’s Family, The Pastor’s Ministry, and Caring for Widows. Pray for the Flock is actually co-written by Ryan Fullerton. Pastor Fullerton is the lead pastor of Immanuel Baptist Church in Louisville, KY and Pastor Croft is the senior pastor of Auburndale Baptist in the same city. Brian Croft is the founder of Practical Shepherding, and Ryan Fullerton serves on their board of directors. It is obvious that these two men have authored this book having a good rapport with each other, and if not, they mention their longstanding friendship a couple of times within its pages. 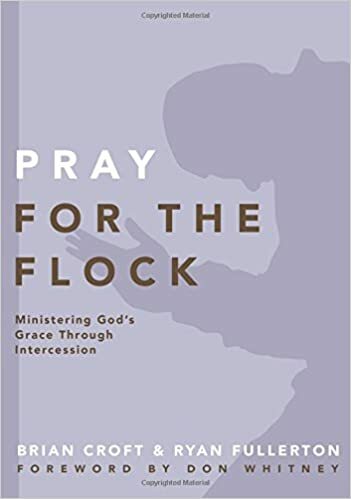 That being said, Pray for the Flock: Ministering God’s Grace Through Intercession, published by Zondervan in 2015, is a short but powerful book on prayer. Fullerton takes most of the first half of the book (Croft wrote one chapter of six in the first half), and deals with the question of why we should pray. In other words, as the section heading states: “What Does the Bible Teach” about prayer? I have read quite a few books on prayer because, like everyone else, I do not believe my prayer-life to be “up to snuff.” I want to learn to pray better, longer, more earnestly, and so I go in search of my answers. I’ve read E.M. Bounds (not every one of his books), I’ve read Mohler, Miller, Tautges, Sproul and others as well. They have helped me with my theology of prayer, some with the practicalities of prayer, and some (quite frankly) have made me feel guilty about my prayer life (and well they should) but none have made me excited to pray. That is what Pastor Fullerton has done in this book. He reminded me that “If we want to have New Testament ministries, then we must understand and practice the New Testament priority given to prayer,” (p. 24) and instructs us: “Don’t just read God’s promises. Like Daniel, pray them. Ask God to bring them into reality!” (p. 45). Why? Because “God has decided that he is most glorified in accomplishing his purposes by answer the prayers of his people.” (p. 45). The reality that “Most of us don’t have a theology of prayer that is capable of getting us out of bed in the morning, let alone powerful enough to move mountains,” is convicting because it is true. But the great thing is that Fullerton doesn’t just leave us convicted, he provides the hope that is needed to alleviate this truth. I’ll let you read the book so that you can get the full picture and have your heart warmed, primed and ready to go to God in prayer. Pastor Croft took the second half of the book, as is often the case. He dealt with the more practical side of praying for the flock in the section titled, “The Practice of Prayer.” This is where the book takes more of the pastoral tone (the first half could be read by anyone, with only a few spots dealing directly to pastors). The titles of some of the chapters in the second half are almost like “click-bait” that can make one think, “I’ve got to read that; how is the true?” Like the chapter titled, “Pray Occasionally.” That is actually the penult chapter of the book (second to last), but each chapter deals with a specific time or type or way to pray. We are to pray specifically for our people, not in general. Each person ought to be prayed over, for, and with. We are to pray with other pastors. We are to pray for missions and that God would raise up and send missionaries and pastors from our churches specifically. Through six short but eye-opening chapters, Brian Croft revealed thoughts I had never considered as to that which we ought to pray. In fact, I have already taken a few of those ideas and put them into practice. My favorite (a “why haven’t I thought of it before” kind of lesson) is getting a little notebook (small enough to fit in my back pocket) and writing every person in the church on a page, then when I hear of a prayer request I can write it down under that person’s name and continually pray for and with that person (adapted a little from his suggestion) and then I contact that person with a short note letting them know I’ve been praying for their situation. The Appendix deals with Pastor Fullerton’s 40-day fast that he had apparently just finished during the writing of this book. I found it a bit slow, and not as compelling, as the rest of the book. However, it still gave great insight as to how fasting and prayer go together. Coming in at only 125 pages, this is the shortest book I have read by Pastor Croft, but it is the best book I’ve read on prayer. I woke up early the other day, having just finished the book, and as I lay there I was wondering what I should do: try to fall back asleep? get on Twitter or Facebook? Then an excited feeling deep within came bubbling up, I knew what I wanted–wanted!–to do: pray. Much of the time we simply don’t believe in the power of prayer or we don’t know how to pray as it seems we say the same things over and over again. If that’s you, I’d highly recommend reading this little book. If you’re not a pastor, I would still encourage you to read this–especially the first half.